Frankie, an aimless teenager on the outer edges of Brooklyn, is having a miserable summer. With his father dying and his mother wanting him to find a girlfriend, Frankie escapes the bleakness of his home life by causing trouble with his delinquent friends and flirting with older men online. When his chatting and webcamming intensify, he finally starts hooking up with guys at a nearby cruising beach while simultaneously entering into a cautious relationship with a young woman. As Frankie struggles to reconcile his competing desires, his decisions leave him hurtling towards irreparable consequences. Director and writer Eliza Hittman (It Felt Like Love) talks about sexual identity, dealing with loss, and growing up in an era of America’s broken dream. 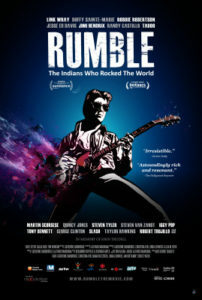 RUMBLE: THE INDIANS WHO ROCKED THE WORLD, reveals the rousing history of American Indians in popular music, kicks off with Link Wray (Shawnee) whose raw, distorted electric guitar riff from the 1958 instrumental “Rumble” was a major influence on rock legends Pete Townshend, Jimmy Page, and Iggy Pop. RUMBLE powers through the music and life stories of artists whose Indian heritage has long been unsung: Delta blues master Charley Patton (Choctaw), “queen of swing” Mildred Bailey (Coeur D’Alene), The Band’s Robbie Robertson (Mohawk), Jimi Hendrix (Cherokee), folk icon Buffy Sainte-Marie (Cree), “guitarist to the greats” Jesse Ed Davis (Kiowa/Comanche), and others. RUMBLE collages historical footage and electrifying performances with commentary by surviving musicians. Music historians, family members and assorted luminaries (including Martin Scorsese, Quincy Jones, George Clinton, Dan Auerbach, Taj Mahal, Steven Van Zandt, Slash, Steven Tyler, Tony Bennett, and Rolling Stone’s David Fricke) weigh in on how Native American musicians shaped the sounds of our lives. The film won the World Cinema Documentary Special Jury Award for Masterful Storytelling at the 2017 Sundance Film Festival. 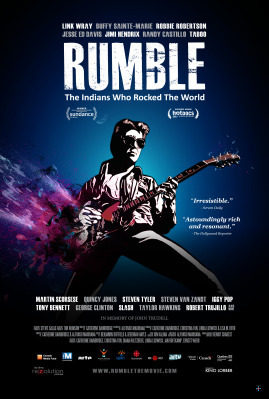 RUMBLE originated with guitarist/executive producer Stevie Salas (Apache), who realized that the public was unaware of the profound contribution of Native Americans to pop music. Salas joins us for a lively conversation on the profound impact Native American’s have had on our collective history, culture and music. In Klaus Härö’s beautifully rendered tale a young man, Endel Nelis, arrives in Haapsalu, Estonia, in the early 1950s. Having left Leningrad to escape the secret police, he finds work as a teacher and founds a sports club for his students. Endel becomes a father figure to his students and starts teaching them his great passion – fencing, which causes a conflict with the school’s principal. Envious, the principal starts investigating Endel’s background… Endel learns to love the children and looks after them; most are orphans as a result of the Russian occupation. 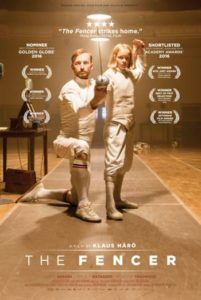 Fencing becomes a form of self-expression for the children and Endel becomes a role model. The children want to participate in a national fencing tournament in Leningrad, and Endel must make a choice: risk everything to take the children to Leningrad or put his safety first and disappoint them. Director Klaus Härö (The New Man, Mother of Mine, Elina – As If I Wasn’t There) joins us to talk about his heart-wrenching, superbly crafted true story about character and resistance in a time of political repression. Ingrid Thorburn (Aubrey Plaza) is an unhinged social media stalker with a history of confusing “likes” for meaningful relationships. Taylor Sloane (Elizabeth Olsen) is an Instagram-famous “influencer” whose perfectly curated, boho-chic lifestyle becomes Ingrid’s latest obsession. When Ingrid moves to LA and manages to insinuate herself into the social media star’s life, their relationship quickly goes from #BFF to #WTF. 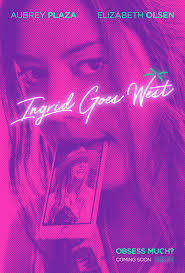 Built around a brilliantly disarming performance from Aubrey Plaza, Ingrid Goes West (winner of the Waldo Salt Screenwriting Award at Sundance) is a savagely hilarious dark comedy that satirizes the modern world of social media and proves that being #perfect isn’t all it’s cracked up to be. Director Matt Spicer joins us to talk about his scalpel sharp tale about celebrity and validation. For over a thousand years, Tibetan Buddhist psychology has taught techniques for overcoming negative, afflictive emotions, such as anger, greed, jealousy, sloth and ignorance. In the film THE LAST DALAI LAMA?, His Holiness explains that Tibetan Buddhism is both a religion and a “science of the mind”; he also shares his crystallized understanding of the nature of mind, and its part in the creation and alleviation of all of our suffering. Believing that this precious wisdom belongs to the world, twenty years ago The Dalai Lama challenged a select group of world-renowned Neuroscientists and Mind/Brain researchers to look into the workings of the mind, and to prove scientifically that “Tibetan Buddhist technologies” for overcoming afflictive emotions are skills that can be learned by anyone. The Dalai Lama commissioned Dr. Paul Ekman and his daughter Dr. Eve Ekman to come up with an “Atlas of Emotions” as a way of understanding the effects of emotions on having a tranquil mind. Being able to recognize the patterns, triggers and responses to emotions is the first step in dealing with them. In a moving sequence with a high school class in British Columbia, His Holiness The Dalai Lama is able to share his passion for the subject. 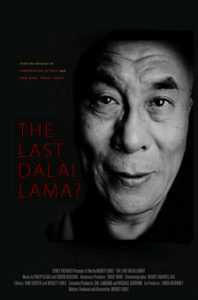 His urgency and dedication come through in THE LAST DALAI LAMA? as he now turns 82, and must deal with the questions of aging and death, and whether he will reincarnate as The Dalai Lama, or if he will be the last of the lineage that has existed for a millennia. Director Mickey Lemle joins us to talk about his three decade friendship with His Holiness and the profound impact he has had on politics, culture and a deeper understanding of our shared human nature. Filmmaker Michael Galinsky takes you on his 12-year journey to heal his back. Suffering from chronic back pain and weeks of living and sleeping on the floor, Galinsky found healing through his work directly with Dr. John Sarno at NYU Medical Center. Sarno had changed shock jock Howard Stern’s life. Veteran Senator Tom Harkin was inspired to campaign for his cause, and he gave comedian Larry David “the closest thing to a religious experience” he’s ever had. Sarno’s best selling book “Healing Back Pain” was first published in the 1980’s, and when co-director Galinsky’s father read it, he was cured of chronic whiplash. 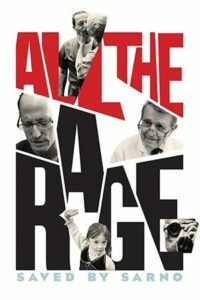 This artful and personal film, ALL THE RAGE – SAVED BY SARNO, braids Galinsky’s universal story of pain and emotion together with the story of Dr. Sarno’s work, connecting the audience to both the issues and the emotions at play. Featuring interviews with Howard Stern, Larry David, journalist John Stossel, Dr. Andrew Weil, Senators Bernie Sanders and Tom Harkin, and other luminaries, ALL THE RAGE offers a profound rethink of our health care. Director Michael Galinsky stops by to talk about his own back pain and journey to find out the connection between the body and personal trauma. All The Rage: Saved by Sarno screens at the Laemmle Music Hall in Los Angeles, 9036 Wilshire Blvd. beginning Friday, August 11. Join Director Michael Galinsky and special guests this weekend. 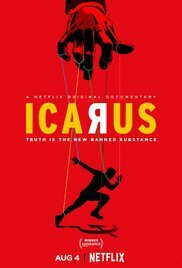 In the truly audacious documentary ICARUS, director Bryan Fogel’s bold gambit was this: to investigate doping in sports, Fogel (an amateur bike racer) would dope himself, observe the changes in his performance, and see if he could evade detection. In doing so, he was connected to a renegade Russian scientist, Dr. Grigory Rodchenkov, a pillar of his country’s “anti-doping” program. Over dozens of Skype calls, urine samples, and badly administered hormone injections, Fogel and Rodchenkov grow closer despite shocking allegations that place Rodchenkov at the center of Russia’s state-sponsored Olympic doping program. When the truth is more complex than imagined, and accusations of illegalities run to Russia’s highest chains of command, the two realize they hold the power to reveal the biggest international sports scandal in living memory. Exemplifying the special bond between filmmaker and subject, this is a vital portrait of the sacrifice some people will make to stand up for truth. ICARUS places you at the heart of an international game of cat and mouse, where a miscalculation can cost you your life. Director Bryan Fogel joins us to talk about his unbelievably prescient film. 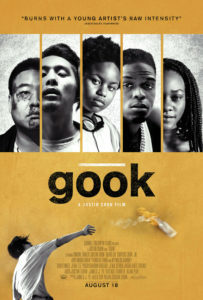 When a renowned architecture scholar falls suddenly ill during a speaking tour, his son Jin (John Cho) finds himself stranded in Columbus, Indiana – a small Midwestern city celebrated for its many significant modernist buildings. Jin strikes up a friendship with Casey (Haley Lu Richardson), a young architecture enthusiast who works at the local library. As their intimacy develops, Jin and Casey explore both the town and their conflicted emotions: Jin’s estranged relationship with his father, and Casey’s reluctance to leave Columbus and her mother. 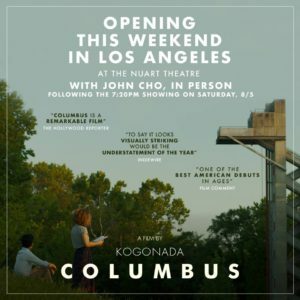 With its naturalistic rhythms and empathy for the complexities of families, debut director Kogonada’s COLUMBUS unfolds as a gently drifting, deeply absorbing conversation. With strong supporting turns from Parker Posey, Rory Culkin, and Michelle Forbes, COLUMBUS is also a showcase for its director’s striking eye for the way physical space can affect emotions. Director Kogonada s a proud immigrant, born in Seoul and raised in the Midwest. He has been noted by Filmmaker Magazine (25 New Faces of Independent Film) and The New Yorker for his visual work and film criticism commissioned by the Criterion Collection and Sight & Sound. He joins us to talk about his emotionally powerful, visually stunning feature film debut. When high school senior Matt (Thomas Mann) meets fellow outcast Jill (Lily Mae Harrington), he falls more in love than he thought possible. However, after graduation comes and Jill moves cross-country to go to college, she loses more than 50 pounds and changes her appearance entirely – much to Matt’s surprise when he arrives to visit her six months later. While Matt struggles to accept Jill’s new choices, Jill begins to question whether Matt is really the man she wants to date. As the distance widens between them, the characters are propelled onto a collision course with brutality and loss, forcing them to confront who they are, who they were, and who everyone thinks they’re supposed to be. Also starring Ely Henry, Lachlan Buchanan, and this feature by writer-director Ian MacAllister-McDonald. McDonald joins us to talk about his touching, heartfelt feature film debut. Special added event: Please join us for a Q&A session after the 7:20PM show on Friday 8/4. Participants will be writer/director Ian MacAllister-McDonald along with cast members Thomas Mann, Lily Mae Harrington, Ely Henry, and Lachlan Buchanan.